Mahendra Guru December 08, 2018 Important Reasoning Questions For Canara Bank PO, Reasoning Ability For Canara Bank PO, reasoning questions. As Canara Bank has released the notification for the Recruitment Of Probationary Officers In Junior Management Grade Scale-I On successful completion of specially designed Post Graduate Diploma In Banking and Finance (PGDBF) Course and the exam is tentatively scheduled to be held December 2018. Looking at the notification, we have now started subject-wise quizzes for the exam. It will include quizzes of all the subjects- Quantitative Aptitude, English, Reasoning and Computer. All these quizzes will be strictly based on the latest pattern of the Canara Bank PO exam and will be beneficial for your preparations. So, keep following the quizzes which will provide you a set of 10 questions daily. 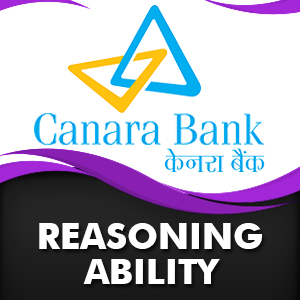 Here, we are providing you important questions of Reasoning Ability for Canara Bank PO 2018 exam. 5. If both conclusion I and II follows. (I) Some home are week. (II) Some iron are week. (I) No plates are window. (II) Some plate are window. I. Some work are not world is a possibility. II. Some world are not place is a possibility. I. All mobile are pencil. II. Some pencil are phone is a possibility. I. Some pencil are not telephone. II. Some telephone are not pencil. I. All D are A is a possibility. II. All E are A is a possibility. I. All C are A.
II. Some E are not C.
Q8-10. Statement: Despite domestic law and international conventions, the theft and smuggling of illicit antiquities remain unabated. (A) Stolen Indian artifacts surface in antiques shops and auction houses across the world on a regular basis. (B) The illegal removal of objects from their archaeological setting erases critical historical information and it depletes a nation’s cultural capital. (C) Museum have to be vastly improved to host antiquities in a meaningful manner and effectively perform their educative role. (D) The national mission on monuments & antiquities was launched to create a register of artifacts. Q-8. Which of the statements numbered (A), (B), (C) and (D) can be the possible step for security of artifacts? कथनों (A), (B), (C) और (D) में से कौन सा कलाकृतियों के संरक्षण के लिए उठाया जा सकने वाला सम्भावित कदम है ? Q-9. Which of the statements numbered (A), (B), (C) and (D) is the result of given statement? कथन (A), (B), (C) और (D) में से कौन सा ऊपर दी गयी जानकारी का परिणाम हो सकता है ? Q-10. Which of the statements numbered (A), (B), (C) and (D) is the disadvantage of given statement? कथनों (A), (B), (C) और (D) में से कौन सा ऊपर दी गयी जानकारी की हानि हो सकती है ?